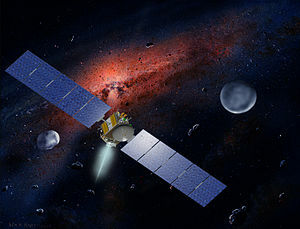 The Dawn spacecraft is accomplishing it’s mission beautifully. I have been following Dawn’s progress for many months via the NASA and JPL websites. This relatively small and inexpensive spacecraft has now completed it’s mission to the asteroid, Vista, and is on it’s way to the dwarf planet, Ceres, where it will arrive in February 2015. And, of course you will find dozens of links to images and additional information on the web pages listed above. This will show you a photo of the sky with both Vista and Seres pointed out on the image. This entry was posted in Astronomy and tagged Ceres, Dawn, Dwarf planet, JPL, NASA, Vista. Bookmark the permalink.